Security of valuable and vulnerable online available business and user’s data should be the utmost priority for the organizations. Recently, Twitter announced the approval of leveraging third party applications to support two-factor authentication (2FA) in strengthening Twitter’s users account security. Twitter announcement to support third-party 2FA apps may be seen as a major update in terms of improving security for their users. The microblogging site is being used by millions of users including celebrities, well-known personalities and many large & small organizations across the globe. With the increasing users, large amount of user data and associated sensitive information, Twitter much needed this major security update as SMS based 2FA was not reliable and trusted. 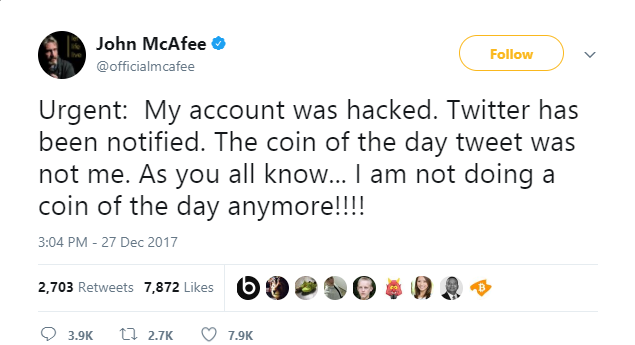 Even personalities like John McAfee, founder of McAfee, are finding themselves miserable in getting their twitter account secured and protected using existing security. What made Twitter to upgrade its 2FA security ? Earlier, Twitter used to deliver two-factor authentication to verify logins via SMS code, getting received on user’s registered mobile number or on mobile app. However, this 2FA method was identified with the probability of getting breached by intercepting the text messages, owing to the weakness in SS7 cell phone network, and thus these messages could be easily exploited and compromised. Further, SMS based authentication involves the risk of getting SMS (stored in mobile and not deleted) accessed by some unauthorized user by any mean to gain account access. But, with twitter’s recent security update, users can now leverage the third-party’s two-factor authentication solutions like Google Authenticator and REVE Secure, which not only allow users to receive unique security code (that automatically gets refreshed or deleted after few seconds) on their devices, but delivers other convenient yet secure options of getting themselves authenticated. Twitter’s rollout plan of allowing and enabling third party 2fa solutions is likely to improve the security of their users. If you are still securing your twitter account using only password or existing SMS-based authentication or protecting any other web-applications using single-factor(password) authentication, then you need to move on to a better & guaranteed 2FA solution like REVE Secure, which guarantees fullest protection to your accounts in a simplest and most effective manner. Next Next post: What to Choose: Multi-Factor Authentication or Single Sign-on?